In total, 343 National EEPA entries were received from 31 participating countries in 2016, which were then narrowed down by the national EEPA coordinators to 57 projects put forward for the European level of the competition. At a meeting in Brussels on 27 September, the EEPA Jury drew up a project shortlist for each of the EEPA’s six project categories. Let´s meet 18 shortlisted winners for EEPA 2016! 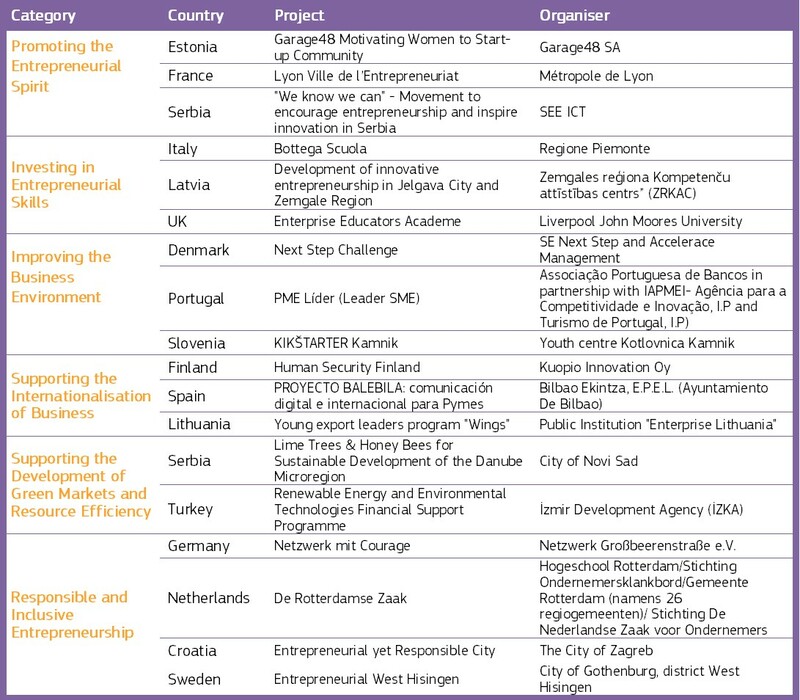 The winners are spread pretty evenly across Europe, with only Serbia featuring on the list more than once, with winning projects in the Promoting the Entrepreneurial Spirit and Supporting the Development of Green Markets and Resource Efficiency categories. We will present all of the shortlisted projects, category by category, on the Promoting Enterprise blog over the next six weeks. The winner in each category will be revealed at the EEPA Awards Ceremony during the SME Assembly on 24 November in Bratislava, Slovakia, when the Grand Jury prize-winner will also be announced. All of the national winners will have their costs covered to send one representative to attend the SME Assembly, while shortlisted projects will be able to send two representatives. Congratulations to all of the shortlisted projects – they are all worthy winners, and the EEPA Jury will have a difficult task in selecting the winning projects in each category. We wish them all the best of luck at the SME Assembly in November.